I’m in my first year on the Digital, Data and Technology Fast Stream (DDaT). This blog post is about my experiences of working in a digital team at Public Health England (PHE). Before I joined the fast stream scheme, I graduated with a politics degree from Glasgow University and then worked in the Civil Service as a Visits Officer. I didn’t have any experience of working in a digital team. You do not need a technical background to join the DDaT Fast Stream. All you need is a passion for making a difference and a desire to be part of the digital transformation in government. My first placement was as a delivery manager at PHE. As an executive body to the Department of Health and Social Care, PHE has more dealings with operational delivery than setting policy. This set-up arguably positions it closer to the delivery of services than other government departments. Working on the forefront of PHE’s service delivery offered me a unique insight into the way the organisation uses the power of digital technology to protect and improve the health and wellbeing of the public. It’s a fast-paced agile environment. I had to learn fast about the digital culture of government during my first few months. When I joined PHE in October, I was the first fast streamer to be placed in the digital team. This allowed me to explore a wide range of work opportunities and helped me identify areas where I could make a contribution. I got a taste of what digital in government is all about: delivering services for the public. The brilliant team I joined is the force behind the Evaluation of Digital Public Health. This project is exploring ways to help PHE and the wider health system better demonstrate the impact, cost-effectiveness and benefit of digital health products. When I joined the team as a delivery manager, the project was at the start of alpha. Over the following 6 months, I witnessed the project evolving from several loose concepts, to wireframes and become a functioning GOV.UK prototype. Work was often emotional: developing services for the public is both challenging and extremely rewarding. Behind each product is a passionate team, learning to work together alongside academia and other government bodies to solve complex issues. Each team is focused on creating something new and valuable, and as a delivery manager, I relished the challenge of guiding work in this direction. 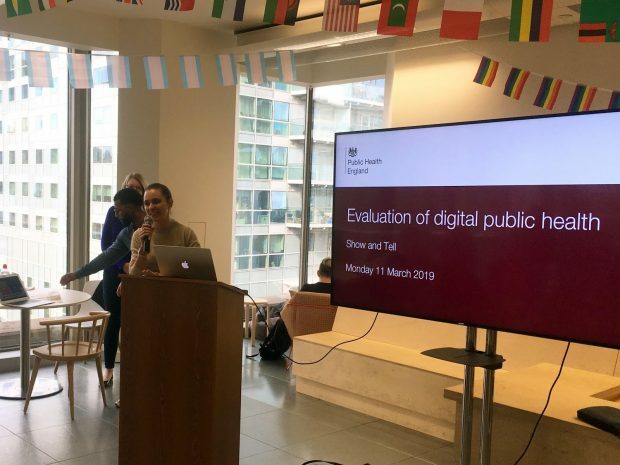 At the end of March 2019, when I left PHE, the Evaluation of Digital Public Health project was preparing to enter a beta phase. What makes this fast stream posting different to others is the unique driver behind PHE’s digital products. Unlike traditional teams in government, PHE embeds the science of behaviour change within its services. During the past 6 months, I’ve learned a great deal about creating products that generate positive impact by influencing people’s thoughts and behaviours. I worked with user researchers and service designers who taught me the importance of delivering services with users in mind. I collaborated with content designers, who emphasised the need for clear, accessible language. I connected with peers from Government Digital Services (GDS), NHS Digital and third sector organisations and I gained an understanding of how to facilitate collaboration with academics to deliver innovative, yet vigorously validated products. It was an incredible opportunity to dive into the world of public health and the organisations that operate in the sector. What makes PHE stand out is the inspiring and infectious passion of my peers for improving the nation’s health. I’ve built a strong network of colleagues who I’m sure will keep in touch once I move on to my next role. Find out more about the Evaluation of Digital Public Health project. Apply for the Digital Data and Technology Fast Stream to start an exciting career in government, transforming technology and building better digital services.